food, health, healing, journey, folk traditions, modern medical technology and revolutionary breakthroughs. 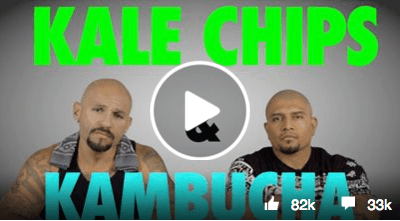 ‘Cholos Try Vegan Food’ is a video that proves an important point. If something tastes good, advertising for it does not have to be in good taste. It can still be great, creative promotional material. This piece is actually part of a new advertising campaign targeting the Latino market. For those who do not know what vegan food is, let me explain briefly. Vimeo version of Kale Chips & Kombucha. This blog post, The Very Versatile Vegetable Pear, started as a facebook mystery Q&A. 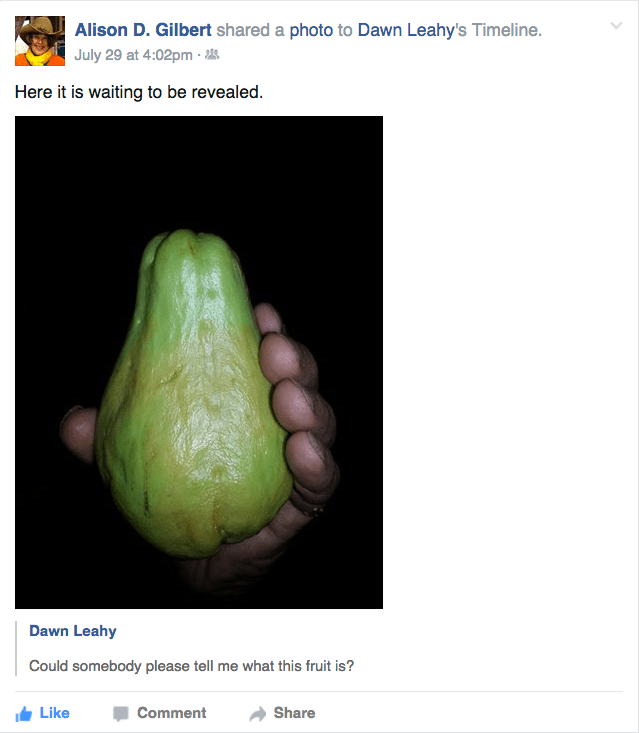 A photograph was held up on her facebook page by a friend, Dawn Leahy, who asked, ‘Could somebody please tell me what this fruit is’? Well that started a facebook conversation about what this green produce item was. Guesses and suggestions came in from all around the globe. Recipes also flooded in. The irony was that they were for both fruit and vegetable dishes. Talk about it being versatile. I thought it might be a papaya. It did have a resemblance. The outsides could be deceptive as they do have a resemblance. But once cut open, there is no mistaking one from the other. 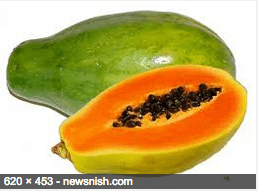 In addition, the versatility of the vegetable pear surpases the papaya and many other types of produce. 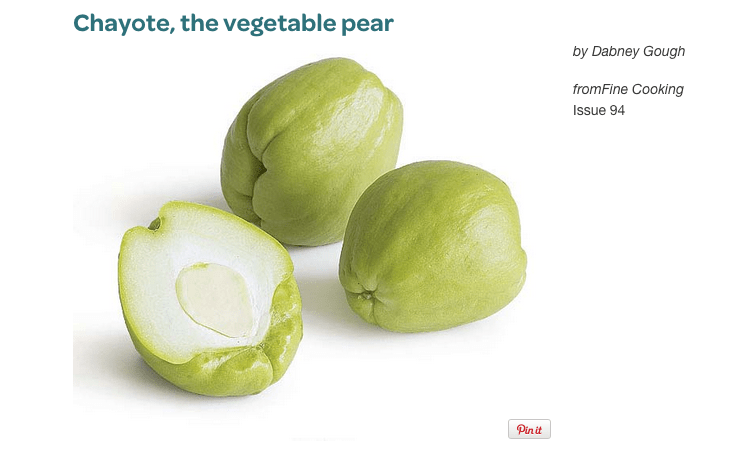 The vegetable pear is known as chayote in Latin America, sayote in the Philippines, choko in Australia and chu chu, elsewhere. It is in the gourd family along with melons and squash. It can be eaten raw, steamed, boiled, fried with butter and garlic as well as disguised as apples for apple desserts. These are just a few comments and recipes suggested by facebook and other friends, Myraflor Quinton Sario Atkinson, Marcus Sean Atkinson, Dominique Neuhofer, Nedvon Tree, Allado Janice Lara Nunes and Aaron Aveiro. Nutritional Fact Sheet from Google. I would like to end this blog post with what is the most exciting discovery about The Versatile Vegetable Pear. 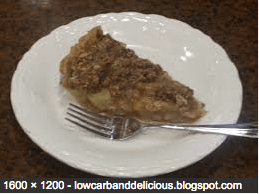 Due to its intrinsically bland flavor, it is the idea substitute for higher carb fruits, like apples and can be ideal for mock apple pie and apple crisp. The vegetable pear will absorb the apple juice and make the most delicious dessert. So used as a vegetable or a fruit, this once mystery item is a fantastic, nutritional discovery. Traditional fermented ginger ale is the only drink I make that is in a similar category to Homemade Organic Fermented Lemonade. These two drinks are kind of cousins because they can both use the same fermenting agent, whey. But for ginger ale, a ‘ginger bug’ is the primary fermenting agent. Using whey in making ginger ale does make it ferment faster. But I prefer not to add it and let the ginger ale ‘slow brew’. In addition, for people who are sensitive to dairy or are vegan, whey needs to be avoided since it comes from dairy. So we won’t be discussing whey today. Our focus will be on making a ‘ginger bug’. My first effort failed. So don’t get discouraged. I have used various recipes as my template for guidance. It is amazing how recipes can vary. That is because fermenting is as much an art as it is a science. There is no exclusive way to make this. The only one that matters is the one that works. And based on all kinds of environmental and other input, the same recipe may not work consistently. Let’s start with the ginger itself. I only use fresh ginger. If it is organic, I just rinse it. If it is not organic, I peel it. Either way, the ginger should be nice and plump, not wrinkled or moldy. Ginger is available in ASian food stores, in health food markets and often in supermarkets. There are two recipes that I used at the start. The first is from Wellnessmama.com calling for a small amount of ginger, sugar and water added daily. The second is from Nourished Traditions and is fairly similar to the wellnessmama.com recipe. I am not sure if I found a recipe for this or if I started doing it on my own. I am admittedly overwhelmed sometimes with caring for all my fermented beverages and food. Daily attention to my ‘ginger bug’ become difficult. So I started weekly feeding of my continuous culture, you never use it up but always save some to start the next one. It worked. And what works even better is using muscovado sugar. It is very dark because it has a substantial amount of molasses left in it. It tastes almost taste more like ginger beer than ginger ale. My original bug is made with a lighter sugar called demerara with less molasses so it is not as potent. The next step in making traditional fermented ginger ale is preparing a ginger wort’. The recipe for that will appear in the next blog post, Traditional Fermented Ginger Ale: ‘Ginger Wort’. Following steps will appear on additional blog posts throughout the coming week. This blog post details information discussed by Alison D. Gilbert, Healthy Living Consultant, on A.M. News on Renegade 101.3 FM. If you wish to share it, please give credit where credit is due. Photography is by the author unless otherwise indicated by scanning your mouse over the image. Thank you. Fermented lemon peel syrup is a serendipitous find. It is made from the leftover peel from juicing the lemons used to make homemade organic fermented lemonade. When I make lemonade, there are a lot of lemon peels left over. Depending on the size of the lemons and the amount of lemonade I am making, I can use between 5 and 10 lemons. That’s a lot of peel. Since I am a strong believer in reduce-reuse-recycle, I like to find uses for things rather than throw them away. Through sheer experimentation, I discovered that lemon peel can be made into both lemon peel syrup and lemon peel candy. Nothing more than the peel and a good quality light organic sugar are required. When placed in a covered container together and allowed to just sit, the sugar turns into a liquid. I just got a gallon of whey. I was able to purchase it directly from the Sohha Savory Yogurt Company in Brooklyn, New York. Whey is what allows the lemonade to ferment creating tons of healthy probiotic bacteria. Since I like everything I eat to have beneficial qualities, I decided to add some whey to my sugar and lemon peel combo. When the syrup forms and can be poured out of the container the lemon peels are in, I will have not only a lemon peel treat but a probiotic lemon syrup. I already am using a small quantity of sweetener for lemonade. The other possibilities of what I can use this special syrup for are yet to be discovered. This post is dedicated to Julia Geha and George Geha who lovingly sent me a package of their home-grown organic lemons. Not only are they the largest and juiciest lemons but the also have great peels. Julia wanted to know what I did with the peels and the syrup that I make from them. I put some syrup in the next batch of lemonade. They live on forever! Julia and George own PeaceLoveBeanie. Please vote for them before March 17th to win a grant from FedEx. The company is socially oriented and does wonderful things. They are the official beanie for I Declare World Peace. Homemade organic fermented lemonade is probably one of our most favorite drinks. It is filled with probiotics for healthy gut bacteria. It tastes tart and sweet at the same time. It is so thirst quenching but so delicious that you want to just keep drinking it. This recipe has few ingredients. It is not difficult to make. It just takes some muscle and patience. I like to do as much of the work by hand because it is good exercise for my arms. The hardest exercise is squeezing the lemons. There are a variety of squeezers you can buy. Some make it easier to get the juice out of the lemon. Others are more comfortable to use. It can depend on the size of the lemon. * I usually make my own whey from draining yogurt. But I wanted to have a large amount. The lovely people who own Sohha Savory Yogurt were able to spare a gallon of fresh, pure whey. The price was reasonable so I stocked up. Continuing with the recipe, fill the glass container with the liquid ingredients. Start with the water and add the whey. Put that aside and squeeze the lemons until you have the desired amount of juice. Pulp can be left in the liquid but be sure to remove the pits. Put aside the lemon peel for making lemon syrup. Mix the liquid ingredients with a wooden spoon and then add the sugar. Mix again. Add the lemon syrup to taste. Cover the jar and leave at room temperature for 2 to 3 days. Then refrigerate and enjoy. This vertical farm is expected to produce 100,000 pounds of vegetables per year. Despite some real questions and concerns, I think this has tremendous potential. Since I have officially become a fermenter, my shopping list has changed to include what I call my ‘fermenting essentials’. That’s not to say that my list was ever a ‘white bread and 2% cow’s milk’, Standard American Diet list. But now my fermenting essentials are regulars on my shopping list. Anyone who is unfamiliar with fermented food and beverages might find my essential ingredients list unusual. I use the ginger for making the most outrageously delicious homemade ginger ale. The process requires a ‘ginger bug’. A concoction made from grated ginger, sugar and water. It is supposed to be fed daily (I forget all the time). It ferments and is a ginger ale ‘essential’ starter. A ‘ginger wort’ is also necessary in the ginger ale making process. That requires more ginger. So I like to keep an ample supply on hand. Fresh squeezed lemon juice is also indispensable for so many of the fermented recipes I make. Ginger ale requires it, lacto-fermented cranberry relish needs it and so does lacto-fermented lemonade. The whole milk, organic yogurt is used to make whey for the lacto-fermented recipes. I usually keep a sizable amount of sugar varieties. But if I run low on one of them, it goes on the list too. So there you have it, my main fermenting essential ingredients. ‘But wait a minute’, you may be thinking.’I just read a lot of ingredients that might also require special utensils’. You are absolutely right. So my list of essential utensils follows. My food and beverage fermentation storage cabinet. I am not going to go into any detail about sweeteners now because that requires it own blog post. I use between 4 types of granulated sugar, two or three liquids and about three or four solids. I want to leave plenty of time and room to discuss them in a way that will be most helpful and thorough. This list of utensils may seem overwhelming at first. Much of it you will probably already own. What you don’t have, fill in as you can. Fermenting is meant to be fun, relaxing and satisfying. So don’t get stressed out about what you don’t have. You can most likely improvise until you do. There are also many discount stores and online sources for these items. So you can enjoy this without breaking the bank. In fact, the benefits far outweigh the effort. In future posts, I will discuss fermenting processes, recipes and other details of this wonderful ‘whey’ of life. Is Fermentation A Hobby Or A ‘Whey’ Of Life? Fermentation of foods and beverages may seem to have started out as a hobby for me. But as I have continued, I have been discovering otherwise. I am learning more and more about these historically documented traditions that add valuable nutrients to food. In fact, before refrigeration and food additive preservation, fermentation was one of the essential, natural means of preserving food. The beauty of fermentation was that it accomplished two valuable results, food preservation, its primary goal, and nutritional enhancement, the natural bi-product of this process. The more I learn, the more food I want to ferment to add to the nutritional value. Today, we live in a world of food preservation technology that has made fermentation unnecessary. Food is prepared and processed with ‘food preservatives’, chemicals that only increase shelf life. Fermentation is no longer needed. Or so it may seem. Ironically, the removal of natural fermentation and the addition of synthetic chemicals is leaving us nutritionally bankrupt. This has resulted in serious health issues for many adults and children. Buying prepared foods that are natural and nutritious can become very expensive. I am exploring alternatives so I can eat healthfully and economically. I’ve begun to go back-to-basics. I’m giving fermenting beverages and foods a whole-hearted try. It is clear to me that this can be a good means of improving and maintaining good health. What I did not realize was that this nutrient dense solution can take a good deal of time. What might have seemed like a hobby initially, has become a ‘whey’ of life for me. Over the last six months or so, I have learned numerous techniques of fermentation. They include using a SCOBY (symbiotic cultures of bacteria and yeast) to make fermented teas, called Kombucha and Jun; using kefir grains or crystals to ferment milk and water; adding whey (a cheese making bi-product) to make lacto-fermented foods and beverages; using a ‘ginger bug’ (a fermented syrup of ginger, sugar and water) to make delicious, nutritious, homemade sodas; and one of our all time favorites, making lacto-fermented (whey again) lemonade. In fact, I make my own whey from yogurt and milk kefir by simply separating the ‘curds’ and ‘whey’ with cheesecloth or a paint strainer. It is easy but adds more time to the process of preparing nutrient rich food. Eating this way increases good ‘gut’ bacteria. A new field of science called the human microbiome has revealed that the human body is only 20% human cells and 80% bacteria. This sheds a totally different light on how we need to look at improving and maintaining health. Our bodies thrive on good bacteria and need ‘probiotic’ foods and beverages to continually supply us with an abundance of it. Processed foods with food additives are, at the very least, dead. At their worst, they rob the body of any healthy bacteria it may have had. This means that eating processed food makes the body vulnerable. It creates a ripe environment for illness. Be on guard when you shop for food. Read ingredients. If there are more than a few ingredients, don’t buy a packaged product. One of the worst food additives is high fructose corn syrup. Avoid it like the plague. Learn to make probiotic rich foods and beverages. It could save your life. As much as I can, I’m going back to how food and beverages were prepared before industrial food preservation. This means creating a healthy ‘whey’ of life supported by the latest scientific research, the human microbiome. We are seeing through the microbiome that when it comes to food, nature’s way is most likely best. I believe that only by going back in time to natural, probiotic enhancing food preparation methods, can we go forward with health. Click on this sentence to read the complete article from Modern Farmer, Farm. Food. Hello Kitty, written By Panicha Imsomboon.